ROLPA, July 2: The Maoist grip on Rolpa, the district known as the center of origin of the decade-long armed insurgency, seems to be loosening with other parties making strategic wins in the recently held local elections in the district. The CPN (Maoist Center), the largest Maoist party in the country, was defeated in three rural municipalities in Rolpa district which is home to over a dozen central leaders of the party. Though Maoist Center heavyweights such as Deputy Prime Minister Krishna Bahadur Mahara, former minister Barsha Man Pun, and former lawmakers Jokh Bahadur Mahara, Jhakku Subedi, Kul Prashad KC Sonam and Dipendra Pun Sijal campaigned actively for the party to win the local body elections, Nepali Congress got victory in Lungri Rural Municipality while the CPN-UML won in Triveni and Runtigadhi rural municipalities. However, no woman candidate was elected as chief and no candidacy was filed under the Dalit quota in the district dominated by the Magar community. Maoists had begun their armed revolt 22 years ago by attacking a police post at Ropla's Holeri, which now falls in Runtigadhi Rural Municipality. A road called Shaheed Marg was constructed through contribution of labor by the locals in Triveni Rural Municipality. These local units were then the headquarters of the combatants of the fifth division and its two branches of the Maoists' People's Liberation Army. Lungri, too, also under full control of the Maoists at that time. The Maoist Center has won the elections in seven local units including Rolpa Municipality. The Maoists have failed to make a clean-sweep in Rolpa, unlike in Rukum district. “Rolpa was not a communist hold before the insurgency. 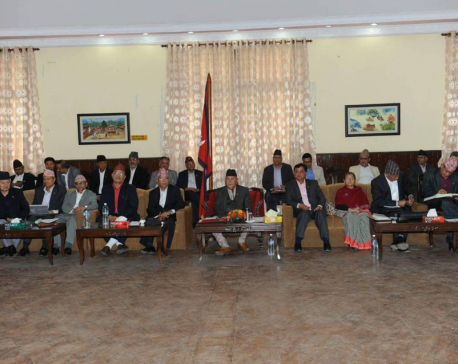 The reason behind the Maoists' defeat in three rural municipalities is internal conflict and the failure to meet the expectations of the people,” said senior advocate Jit Bikram Malla. “We lost the elections and will analyze the weaknesses,” said Maoist Center politburo member and Rukum-Rolpa in-charge, Dipendra Pun Sijal. “It's not fair to say that other parties should lose the elections here,” he added. “It's not a defeat of the Maoists but an inclusive victory to promote democracy due to the rising awareness level of the people after the insurgency,” said senior journalist Kashi Ram Dangi. Three ex-combatants and brigade commanders were elected as chiefs of local bodies in the district. Bir Bahadur Gharti won in Thabang by defeating Amit Gharti from the Netra Bikram Chand-led CPN Maoist. Similarly, Gunendra Gharti and Bir Bahadur Khatri from the Maoist Center won in Subarnabati and Sukidaha rural municipalities, respectively. Former district chief of CPN-UML, Sant Kumar Oli, who was defeated by Pushpa Kamal Dahal 10 years ago, won in Triveni by defeating Maoist brigade commander Ganga Bahadur Gharti. Voter turnout in the district was 69.14 percent. Out of the total 72 wards in the district, Maoist Center won in 47 wards, Nepali Congress in 12 wards, CPN-UML in 11 wards and independent candidates in two wards.